Last week I threw a little party. Throwing parties intimidates me. I feel like everything should be perfect. But I am here to tell you, that is soooo not true. You don't have to have matching wine glasses or an organized home to have a party. As a hostess with the mostess, I took a page out of my limited waitressing experience. A million years ago, I worked the night shift at a restaurant chain in Pennsylvania called Eat'n Park. The restaurant is a place you eat breakfast all day. It's a place where senior citizens go for coffee during the day and drunk college kids go for coffee in the middle of the night. The restaurant is also known for their smiley face cookies--every customer gets one. 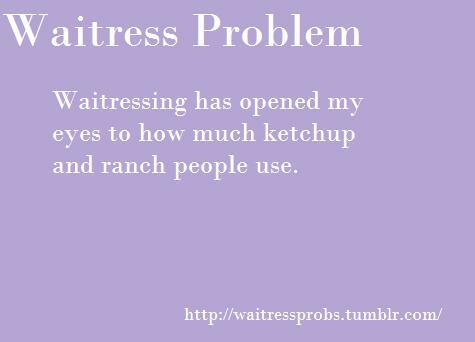 I found this funny quote on Pinterest from a HILARIOUS tumblr page called: Waitressprobs. You must click here to go laugh, especially if you were ever once a waitress or ever eaten in a restaurant. I was probably one of the worst waitresses of all time. It didn't really matter in the middle of the night because most of the customers were too drunk (or too creepy) to get mad when I got their order wrong. And I always remembered their coffee and their cookies, so all was usually forgiven. The occasional day shift I worked was different though. They cared about their orders, a lot. And I got their orders wrong, a lot. But I always remembered their smiley face cookies and I smiled. Almost every customer appreciated my smile or my sense of humor. Usually people thanked me for being nice even if I made mistakes with their orders. They simply appreciated that I was sincerely nice and friendly. And I got pretty good tips. I never improved as a waitress, but the lessons of sincerity, being nice and smiling stuck. Those lessons have helped me over the years. And they helped me again with my party insecurity. When my guests arrived I greeted them with my best Eat'n Park smile. I offered alcohol instead of cookies and fun was had by all. No one cared about the imperfections. It might help that I have some pretty rad friends. Friends that don't blink when I say "Oh, don't open any cabinets because everything I crammed in there five minutes before you walked in will fall on your head." The imperfect waitress lessons of yesteryear also helped with my Pinterest Poser Challenge*** projects this week. I had fun prepping for my party and didn't care if they weren't mindblowing or perfect. I went a little nuts and it looked a little bit like Pinterest threw up in my house for the party, but I loved it. This project was for one of my party's themes (there were multiple--cinco de mayo, mother's day and more) a little post Cinco de Mayo fun. I saw this on Pinterest a few weeks ago and fell in love. It was simple and cheap. All you need are multi-colored sheets of tissue paper, a stapler and some time. Stack approximately eight sheets of tissue paper and folded them like a fan. Staple a few times in the middle and then unfold each sheet of tissue paper. Then tape them up somewhere. I duct taped them to the archway that separates my dining and living rooms. I couldn't put the flowers all the way down to the floor because of my new puppy who apparently loves to eat tissue paper. It was definitely a fun and festive decoration for my party. I love it so much that Lucy and I have decided to keep it up all summer. Another cheap, easy but quite lovely project. I bought a box of glass jars at Target for $8. I found paint in my craft cabinet and used my kids' paint brushes. The paint was Patio Paint that I bought at Michael's for the kids to paint rocks (a favorite summer past time around here). While watching TV, I painted a couple coats of paint on each jar. After the paint dried, I took a nail file and randomly distressed the paint. 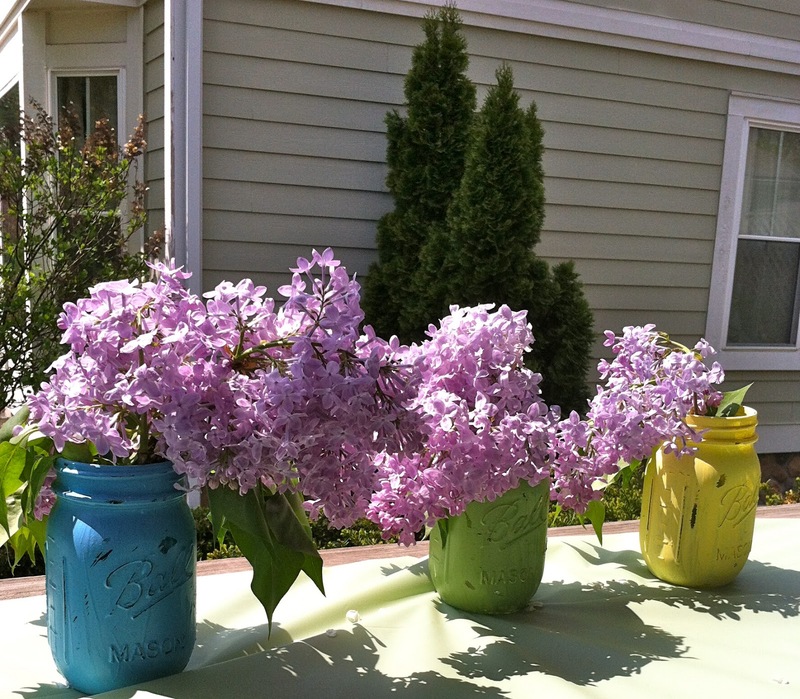 Threw some Lilacs in and BOOM, you've got a great centerpiece for a summer table or a garden party. This was the set up on my porch for my party with the jars. Another theme was wine. The gift tags were cut 10 minutes before the party and due to a lack of a hole puncher I jabbed a pencil threw each tag to make way for the ribbon. I'm no Martha Stewart, but they didn't turn out so bad. This was such a cute project, I made some as a gift for the mothers in my Sunday School class at church the next weekend for Mother's Day. I also served up an old favorite at the party, the Seven Layer Dip in Individual Cups. A fan favorite for sure. Click here to read about how to make these. There it is, my mismatched dishes, party themes and Pinterest projects all served up with a smile. 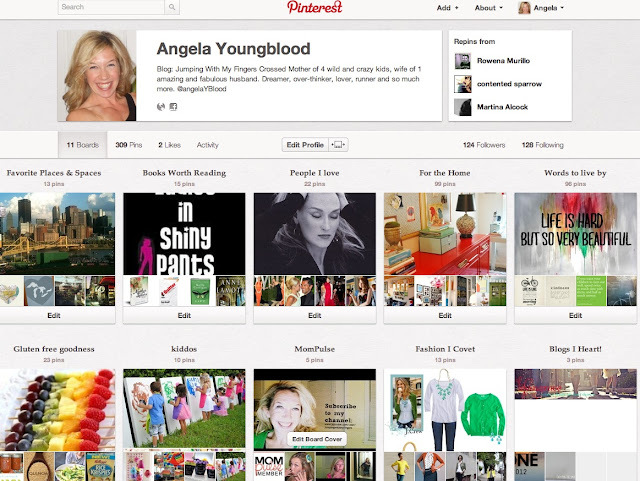 Hopefully you feel inspired to paint, craft or host a party. Whatever you do, I encourage you to sincerely have fun with it. The decorations look adorable. I loved that over the door wall décor and those colorful mason jars are also stunning. At the local Los Angeles venues I also hosted a garden themed bridal shower for a cousin and I also painted the mason jars and used them as table centerpieces.